"Teenager Finds Baby Bat in Her Bra"
"Light the Bloody Thing Yourself"
stride down there...and light the bloody thing yourself." 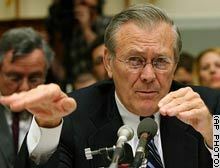 This wacky website has catalogued many of Rumsfeld's hand gestures and given them names associated with martial arts moves. This is old news (from 2004), but still fun. Today is February 28, and this is the day for all good bloggers to publish the Danish cartoons. Yes, this cartoon is one of the twelve that has resulted in demonstrations and riots around the world, and the deaths of some 150 people. Newspapers have been shut down, publishers have lost their jobs, and editors and publishers are sitting in jail in some countries. Yet no major American newspaper - and certainly not the Boston Globe - can bring themselves to print these cartoons. See the whole lot over at Michelle Malkin's blog. The GatewayPundit has lots of links to articles about this matter, scroll to the bottom. Honore de Balzac, French novelist, 1799-1850.